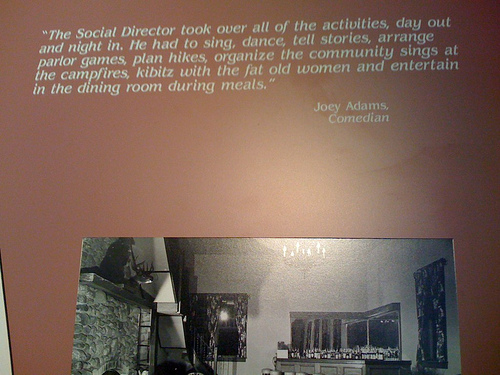 We were passing through the Catskills during the 4th weekend and we stopped at the Liberty NY museum.Tummler was a full-on regular job at these resorts and it helped launch the career of many great performers including Mel Brooks, Sid Ceasar and Joey Adams. The people who stayed at these resorts were immigrants or children of immigrants and this was their time out of the city to spend some time in a pool, eat some good food they didn’t have to cook themselves and socialize. People often went back at the same time every year and community and participation was a big part of the experience. Lower costs of more exotic consumer vacation destinations like the Caribbean led to the closing of these resorts but they led to a loss of connection and community.